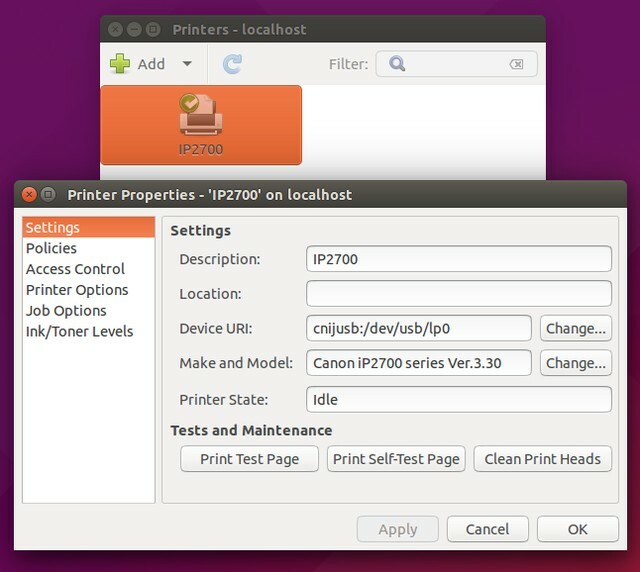 How to setting up Canon Pixma IP2770 in Ubuntu - Almost of we know, Canon is one of the largest printer manufacturer. If you have any canon printers, and meeting some difficulties while install it on your Ubuntu, I hope this article can be the solution. A days ago, I'm successfully install Cannon PIXMA IP2770 driver and work properly in my Ubuntu 15.05 Vervet Vivid. However I'm facing little problem about dependency, but I'll tell you how to solve it. So you do not have to worry about it anymore. Now you can open it via Ubuntu dash menu. Cheers...! That's all I can write about How to Setting Up Canon Pixma IP2770 Printer in Ubuntu 15.04. Hope you've enjoyed reading this tutorial as much I’ve enjoyed writing it. Thanks for visiting us.